Killing time | Paul Hassing's autobiography. In the late 1960s and early 1970s, child’s play was a serious matter. At our disposal were instruments of death that required bravery and mastery. Pictured above is The Board: a device comprising a heavy wooden beam, bolted onto industrial piping, and covered in thick black grease. For the uninitiated, it swung gently to and fro. But for the seasoned practitioner, it could slice a careless cranium clean through. The trick was to build momentum. Then keep going. 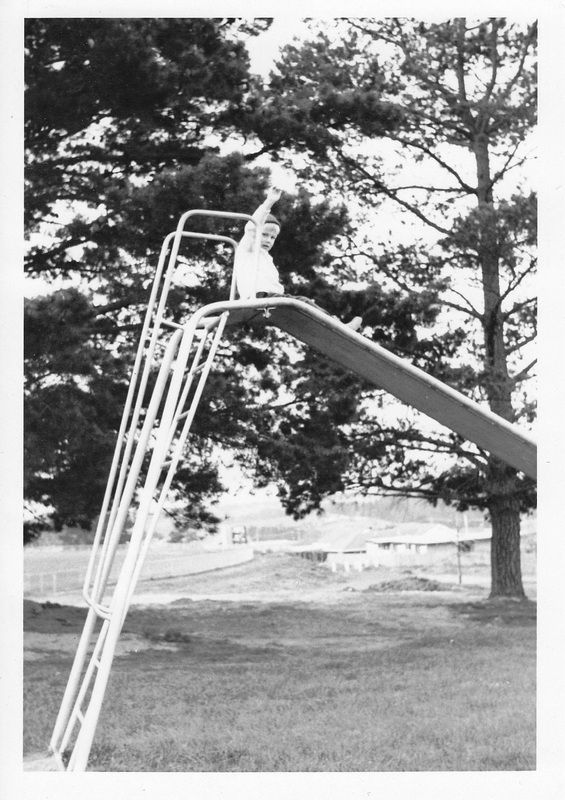 With practice, The Board could be swung high enough to smash into the supporting crossbar such that the entire apparatus shook and bellowed in a terrifyingly satisfying manner. But before mounting this Jagganatha, kids had to be progressively desensitised to its destructive force. Phase One comprised The Slide. Having ascended to a height exceeding that attainable around the home, a (usually male) candidate was required to write his will, then cast it to the four winds to show contempt for Fate. He was then at liberty to brave the mud, puddles, gravel, baked earth, broken glass, dog poo, dust or nails – depending upon the season and the perversions of other park users. Not for us the sanctuary of chip bark or the soft, reconstituted rubber landings of today’s helicoptered offspring. Life was elemental. Its lessons elementary. With caution spurned and Death scorned, the candidate embraced the road to ruin. Those who survived their test progressed to Phase Two. Moving from a passive to an active device understandably startled many. In one’s hands, rugged chains of iron. At one’s feet, enough heavy metal to brain a bison. These, combined with speed, left candidates in no doubt as to where they were headed. Like The Board, The Swing had lethal potential. Swing higher and jump off. Swing to the apogee and jump off. 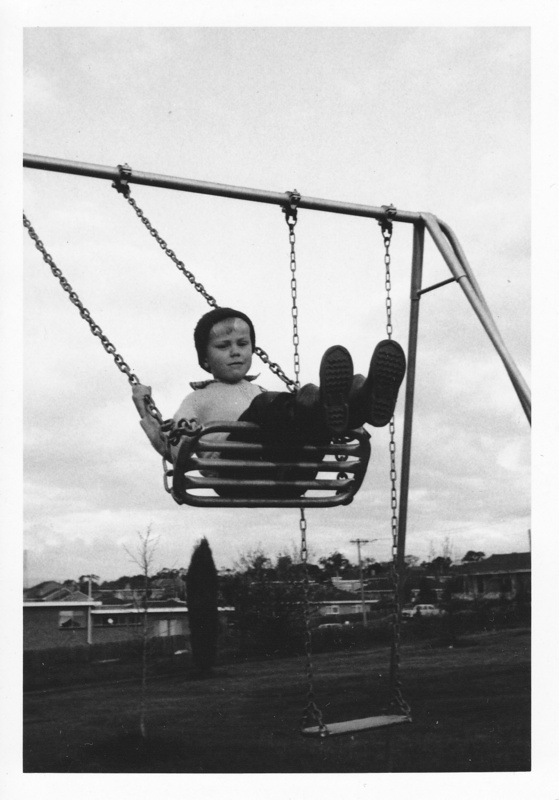 The Swing also had an ultimate goal which, in hindsight, was inherently Sisyphean. This goal was to swing so high that the pilot described a full circle and returned to Earth – with chains shortened by the circumference of the device’s crossbar. Contemplating the dispatch of his first victim, the candidate’s demeanour hardens with devoted application. 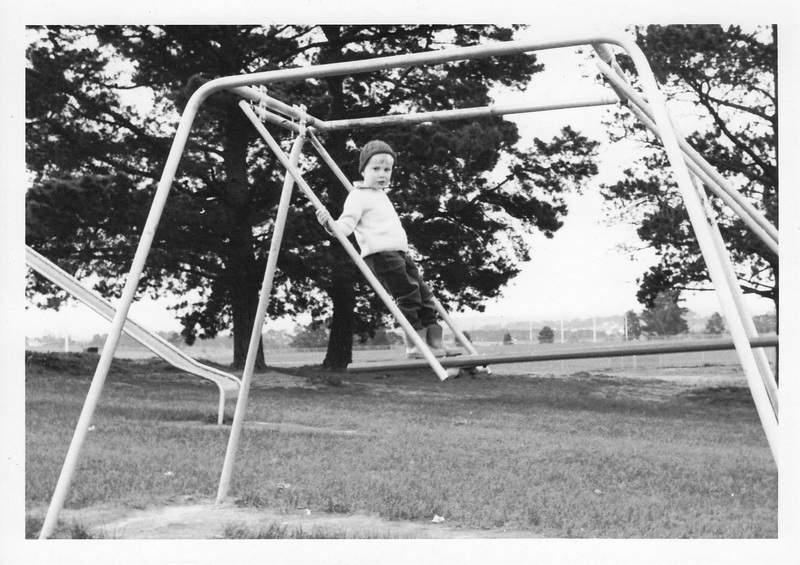 I never achieved The Swing’s ultimate goal. Nor did I see it done. But at every park, someone knew someone who knew someone who’d done it. And it was never achieved without multiple broken bones. Happily, despite my incomplete preparation, I graduated to The Board. Only to find that, a few years later, all Boards disappeared. At first, their empty frames stood in mute protest at an approaching age of innocence. 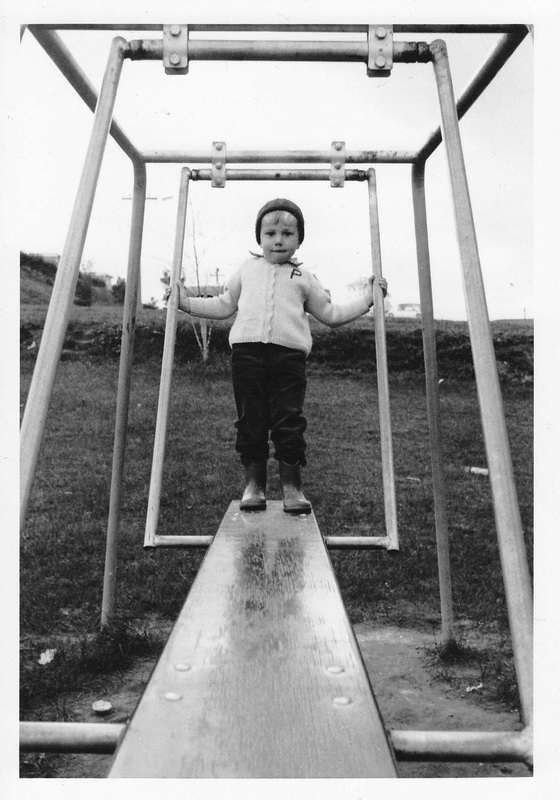 Next, they were converted to wholly unsatisfying monkey bars – replete with safety mats. Then they disappeared completely, along with heavy hardwood see-saws and the always-rare three-storey iron rocket ship (with its improbable steering wheel at the top). Instead, brightly coloured rocking animals sprang from the ground. Replaced by aerated rubber seats, so soft they couldn’t crack an egg. Or worse, inverted car tires. Or even worse, bespoke baby seats – with safety belts. It’s scant wonder to me that today’s coddled, aseptic parks attract few children. They’re all at home – playing violent games in cyberspace and learning nothing of the real world just outside. I suppose one could argue that they’re safer. Brought to you by The Feisty Empire and Imagine Day. Hi Paul. Reading your last post about children’s play equipment and your reference to a 3 storey rocket inspired me to share these pictures from Benalla that my two boys have had the joy to climb on a number of occasions. Keep on writing. Very best regards, David. The dream lives! And is that a steering wheel I spy? On inspection, the rocket could be said to have four stages, not three. I shall consult Elon Musk. Thank you, David, for your wonderful, colourful bookend. I think it’s bulk ace in the extreme! I remember all this equipment (now that you mention it – thank you). 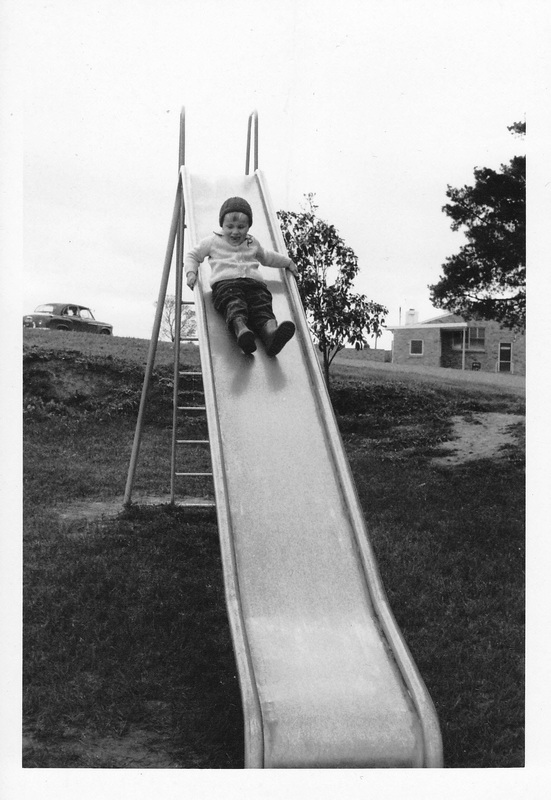 My brother fell from the top of one such slide – climbing up the ladder mind you – and split his head on a sharp edge of the exposed concrete foundation. Those were the days. Independent verification! Greater love hath no researcher. Please tell your brother he suffered not in vain. Pain notwithstanding, this is very exciting intel. Kind regards and a hearty slug of Mercurochrome, P.
Right on, what was a primary school lunchtime without some kid or another bleeding profusely from the mouth are copping a metal swing in the chops? I’m sure kids were expendable in the 70s. Bikes without helmets, trampolines without nets, pools without fences, billy carts without brakes, bonfires and, scarily, Easter eggs with lactose … Back to the new episode of Gilligan’s Island now, regards Barry. Thank you, Winno. I’m sorry you’ve had such trouble and am grateful you persevered with your feedback. I too was stunned to find that Mercurochrome is no longer for sale. Very nice, Winno! It sounds so much better coming from the source. Best regards, P.
Not duplicating my comment, well yes I am,, but I can now access your blog Paul. Whoopeee! Techo fixed it. It was a regen of the opt in valve! That is indeed fantastic, Winno! I’m so pleased we can see your smiling face again. Thanks so much for staying the course. Kindest regards, P.
I’m delighted to be able to heap praise on you for your wonderful anecdotes and ponderings!